The daily online musings of a popular Chinese actress and director has turned her into one of the world's most widely-read bloggers. Xu Jinglei has just celebrated her 100 millionth hit since starting the blog less than two years ago, according to the Chinese website Sina. At one point last year, her site topped the list with Technorati, the respected US-based search engine for blogs. Analysts say her success signifies the power of the internet in China. 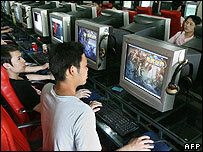 Even though only a fraction of China's 1.3bn population use the internet, online use in the country has grown rapidly. The number of internet users rose to 132 million last year - making it second only to the US. The government has encouraged internet use for education or business purposes, but has come under fire for censoring items it deems subversive or offensive. Xu Jinglei, 33, is an acclaimed actress and director with a reputation for having a high intellect and integrity. In her blog, which she started in October 2005, Xu steers clear of plugging her career and instead focuses on her daily life, reflections and frustrations. She ranks in the top 50 of the 75 million blogs worldwide, tracked by San Francisco-based Technorati. For a time last year, she headed the list. "When one billion people decide to do something, it has a ripple effect all over the world," Technorati's Derek Gordon told the San Francisco Chronicle. "As the country begins to be more wired and connected... we're clearly going to see more Chinese voices coming online."